A thesis on “point and tap” adventures! One of the best things about attending video games events is the chance to meet interesting people. When we attended “Adventure X” last December, for instance, we were lucky to meet Alasdair Collinson , a German developer who has taken his interest on point and click adventures a step further. In fact, when he told us he wrote his bachelor’s thesis on the changes that the interfaces of point and click adventures have experienced when ported to smartphones and tablets… our jaws dropped six inches. And they dropped six inches more when we had the chance to access his thesis: 78 pages in which he thoroughly analyzes the basic elements of point and click’s UI’s, the limitations developers have to face when designing graphic adventures for portable devices… and how they have managed to overcome them, whether they succeeded or not. Therefore, here is a link to download his superb work. 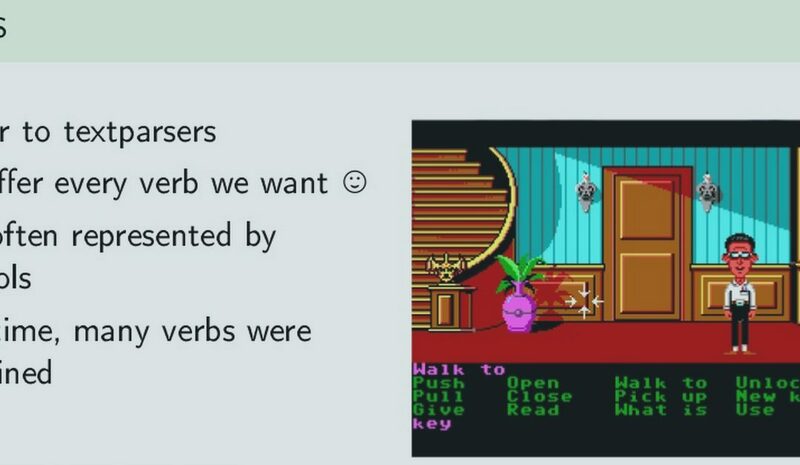 Alasdair also gave a talk on this subject at Droidcon Berlin 2013, so you can also watch a 30 minutes summarized version of his thesis at the Droidcon’s site… or you can do it right here (yes, we know: our kindness is lovely). What do you think of Alasdair‘s work? Do you know of any other research as thorough as his? We’re all ears!